Last spring, I was reading a book by Kevin Trudeau called Natural Cures They Don't Want You To Know About. In it, he makes a lot of claims that he does not necessarily back up with substantiated proof, which annoys me. It's a good book, but when someone is making claims like that, it would be nice to see references to studies where someone has actually gathered some evidence on the subject. It was in this book that I first heard anything about the Nazis inventing the microwave, the Russians banning it, and the first time I heard anyone say anything about throwing it out completely. He claimed that microwaving food changes the energy of the food--energy that all things have, created by how our molecules vibrate. If you photograph an apple with Kirlian photography, it's energy pattern is beautiful and round. If you microwave that same apple, then photograph it again, it's energy pattern is rough and jagged and ugly. I was already aware of the microwave oven's propensity to create cancer-causing free radicals with the way it heated the food, but thought that using it to heat water would still be fine. This was the first time it had ever occurred to me that it might alter something fundamental within the chemical structure of what was being microwaved. That's when I came to a claim I knew I could check. Kevin Trudeau said that if you try to grow beans with water that had been microwaved, they would not even sprout! I raised an eyebrow, thought about it for a minute, then got to work on an experiment a là Grade 7 Science. I used navy beans from my cupboard, splitting them into a control group of six, and an experimental group. The first group was watered with Reverse Osmosis filtered water. 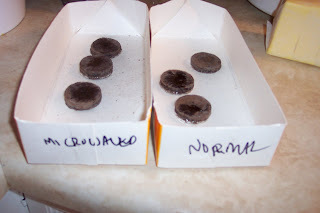 The second group was watered with RO water that had been microwaved for 1 minute per 8 oz. (or 250 mL - I'm Canadian. That means I'm measurement bi-lingual) and allowed to cool. 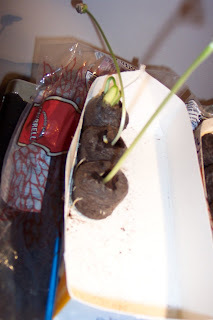 What I should not have done, since I was testing this "not sprouting in nuked water" claim, was plant them in the peat pellets (2 per pellet, 3 pellets per tray), which I didn't think of ahead of time. 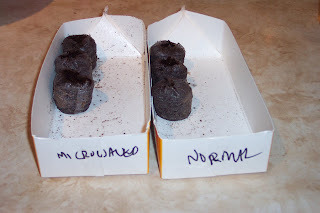 The peat pellets gave them nutrients that the water did not contain. I heart Peat Pellets. They are so fun. 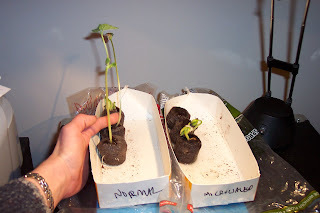 "Beans in 'normal' tray have grown and thrived - 2 pellets have sprouts that are a minimum of 5 inches, while the third has a 1 inch sprout. In the 'microwaved' tray, the sprouts have remained at a height of less than 1 inch for days, while the third has none at all." Photo from March 18, as well as two following. 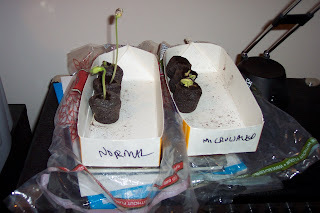 That means that in the normal water tray, all three pellets had sprouts--two of them had sprouted both of the beans they contained. They thrived and grew tall. 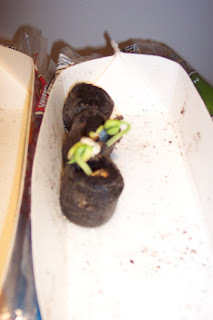 In the microwaved water tray, only two of the pellets had one sprout each, which were stunted, brown around the edges, and did not thrive at all. Other than the type of water used, all other conditions were the same for both groups. At this point, I believe I moved them from my office to my living room so they could get more sunlight, at which time my 18-month-old decided they would look better upside-down on the floor than on the coffee table. End of experiment. I do intend to repeat this experiment, sprouting the beans in water only. If any of you try this, please leave your comments and results on this post, or e-mail them to me and I will post them here for you. Needless to say, it was enough evidence for me to be concerned. After that, I started getting a little fanatical about not using the microwave, even asking for my food to be un-microwaved in restaurants. In doing so, I discovered that what may only take a few seconds to re-heat in the microwave really only takes a few minutes on the stove. What health sacrifices are we making for a few minutes' convenience? What's the rush--so we can go watch T.V.? If we are in such a hurry to heat up our food, perhaps we are moving too fast! Very interesting experiment Talena. We just may try this one for ourselves. Our home is quite anti-mircrowave but we're not sure if we should give the thing away or dump it. A whatt?? I am so shocked!! And we use microwave every single day numerous number of times!! I have another thought that just struck me right now as I was writing this. I guess I would want to try another batch with water boiled on gas and see what effect doe that have too! Is it just the heating that makes this change or is it the microwave vs the gas vs normal tap water? Dawn - The only reason that I haven't dumped mine is because we heat up our corn bags in it, which my husband has been using to apply heat to a damaged finger for the last six months. (Also, they are quite nice for toasting up the feet in bed on a cold winter's night.) Let me know how your experiment goes! NM - My suspicion is that the gas heating will have no effect at all, unless you are using water that has been previously microwaved (and therefore previously altered.) See my post from three days ago for more detailed information about how a microwave works. Talena, you really do have a gift for writing! You always have such pertinent/interesting/down to earth (occasionally pithy) remarks to spice up what you are trying to teach us!! And I REALLY do appreciate the research you do to substantiate what you are trying to teach us. The world is a MUCH better place because you are in it! !